Found three more 76-P T2 Clashed Ikes. I was going start another thread, but for organizational purposes I figured I would keep all of my information on the subject in one place. 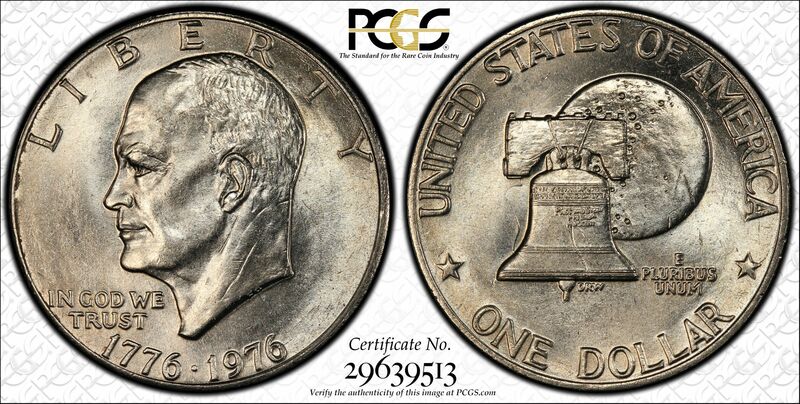 If the pieces I've collected, the strongest A+ example is my 76-D T2 with clear unabraided clash marks on the obverse and reverse at a grade of MS-64 in PCGS. It is the only Denver example I have. The other 7 (going in my various albums) examples are from Philly (seems to go against previous issues where more clashes came from Denver, but my sample size is still small). My grade A- example of the Philly t-2 Clashed coin is trueviewed above MS-63, reverse shows up great, obverse is harder to see in the photos. The other 6 are all Au-Bu coins with bag toning and probably grade C clash features. They are there in the right rotation, but you have to know what you're looking for. Anyone else out there actively finding these clashes? Any effort/thought been put into how to DIVa-tize them moving forward? When talking about naked eye varieties, the markers don't get much bigger than Ike's nose jutting out of the bell or the bell yolk clashing Ike's chin.